Stefan Zweig is not a household name, but not an obscure one either, though until the Zweig-inspired Wes Anderson film, The Grand Budapest Hotel, his was a seldom remarked and sparsely praised literary-historical presence. The Vienna-born novelist, biographer, poet, essayist, story writer and memoirist was the most translated author of his time, and in the wake of the Nazi occupation of his homeland, his works and his legacy were all but expunged from history in his native tongue. Arguably his most lasting and influential work was his reminiscence of a time and place, the Central Europe, and in particular the Vienna of his youth and young adulthood during the first decades of the Twentieth Century, The World of Yesterday. Zweig presents a world that appears to reside in a kind of suspension from history, a golden era in many ways, well past the disruptive and destructive European wars of the Nineteenth Century and before the devastating ones to come in the Twentieth. It was a Vienna, according to Zweig, where intellect and artistic achievement were highly and widely prized, there was broad acceptance of nationalities and ethnicities, indeed tolerance in general, social progress was valued and manifest, Austrians the beneficiaries of what we now would identify as a generous safety net that provided every Austrian with relative, and much welcomed security. The world had advanced, as Zweig himself believed, the worst inclinations of human nature and politics if not surpassed, largely, and perhaps permanently set aside, managed, or out of favor. History had reached a moment, rested upon a plateau that an American observer might describe as Jeffersonian, where there was sufficient time and sufficient leisure for, and more importantly, pervasive interest in devoting oneself to higher pursuits, learning, beauty, art, ideas. The prevailing sense was that it would always be so. Austria, Europe surely, and even the world beyond would continue on this path of steady improvement. Obviously it did not, catastrophically so. Grand Budapest Hotel, like other of Anderson’s films (Rushmore, The Royal Tenenbaums, Moonrise Kingdom) has no recognizable counterpart or even familial resemblance to any movie that I can think of, at least not in American film, and certainly not in Hollywood. That he would draw inspiration from The World of Yesterday, which, though it conveys Zweig’s optimistic and congenial nature, also is permeated, naturally, with an abiding feeling of loss, and create such a wickedly funny and clever, and flamboyantly vivid movie, for me at least, affirms again an awe-inspiring knack for creative legerdemain. Indeed, the story takes place in a fictional hotel, in a fictional country, peopled with wholly invented characters, and yet, sometimes down to the smallest detail, perfectly recalls a specific time and place. Anderson has said he likewise took inspiration from several of Zweig’s novels, but whatever he put into the pot and stirred, the result is a dazzle of rococo visual style, absurdist plotting and slapstick presentation, all of which still manages to compellingly evoke the Central Europe of the early Twentieth Century. Old enough now no longer to be classified still as a wunderkind, like any highly idiosyncratic artist, audiences tend to find Anderson’s work either refreshing, sui generis, touching, thoughtful and invigorating, or else unbearably annoying, gratingly pretentious, gratuitously juvenile and utterly detestable. I will say having read numerous interviews with Anderson, and listened to several discussions, Anderson at the very least isn’t what one might call a literary tourist, and in fact strikes one rather as a literary person as most of us would conceive of one, and remains as far as he possibly could be, from the Hollywood sensibility raiding literary works for the purpose of transforming them into ghastly products, or with good, but misguided intentions, clumsily bringing highly regarded books to the screen. What can’t be forgotten, and isn’t by Anderson, is that this world so colorfully recreated in the movie, and lovingly recalled by Zweig, is doomed. In the movie there are both signs and real events to convey that everything is about to change, and in a not very pleasant way. Zweig’s recounting of what transpired is of course detailed and quite specific. This is where the import of the book insinuates itself uncomfortably, yet presciently in my view, into the present. Anderson has said nothing in anything I have read or heard that could remotely be construed as revealing any intent for the film to be cautionary, nor is any such quality evident in the film itself. That said, and especially discernible during repeated viewings, there nevertheless is an elegiac undercurrent if not overt aspect in the film. Zweig’s own world and the world itself at the time he was completing The World of Yesterday were in such a shambles, it was difficult to know if there would even be a future, much less speculate what it might look like. Yet to the extent all books are written as much for the future as for the present, only a dolt would fail to see the universal warnings in what he recalls. Zweig was a traveller and letter-writer, and he had friends spread across Europe. During a visit to Italy in the 1920’s, he witnessed the Blackshirts in the streets of the Italian towns and villages as fascism in Italy was coming to power. In Salzburg, near the border with Germany, where he took up residence after the first of the world wars he became aware of the Brownshirts who regularly crossed the border into Austria to propagandize and organize Austrian sympathizers. As sunny as Zweig seems to be temperamentally, his memoir is permeated, quite naturally by despair and disbelief at what has happened to him, and happened to the world. 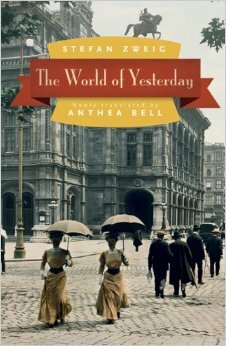 He describes a sense among the Viennese of the time, and among Europeans even more generally, that life will always continue as it is today, always will be more or less, as it is at present. What seemed preposterous then, and for that fact seems even more powerful and tragic now, is the idea that a civilization can indeed collapse, even the most seemingly stable one, even one transformed and demonstrably enlightened. What’s more chilling, and even more pertinent to the present I would suggest, is Zweig’s descriptions of his fellow Austrians, the Viennese especially as they encounter the signs, the augurs, the indications of the materialization of the darkness to come, with an almost resolute denial, and later, a blithe fatalism, the two mixing together to render a strange sort of intoxication. Zweig regards it all, when it becomes entirely too concrete, as akin to a waking dream, life taking place around you, but in your dream-state helpless to act yourself. To reduce The World of Yesterday to the cautionary would be to unforgivably trivialize it. Zweig had lost everything, his home, his lifetime collections of books, manuscripts and musical scores, witnessed his books banned and burned, friends and family brutalized, the civilized world of yesterday delivered to barbarism. Having fled to England, and eventually all the way to Brazil, the day after completing The World of Yesterday he, together with his wife committed suicide. Our own present is unlikely to be mistaken by anyone for an idyllic era. No one really talks about underestimating the forces of reaction or regression, the allure of philistinism, the power of nationalism and xenophobia, fanaticism and the ideologically extreme. I sometimes have that sense of living in a waking dream myself, when I observe the political world unfolding everyday around me, wondering if I am the only one to notice. That I see those signs in the present of something dark to come, signs visible, even in plain sight, and the all but the same infuriating complacency surrounding me, it may only be my own neurosis, or my own political imagination unacceptably out of kilter. In any case, extrapolate from Zweig, and even from The Grand Budapest Hotel, what you will.